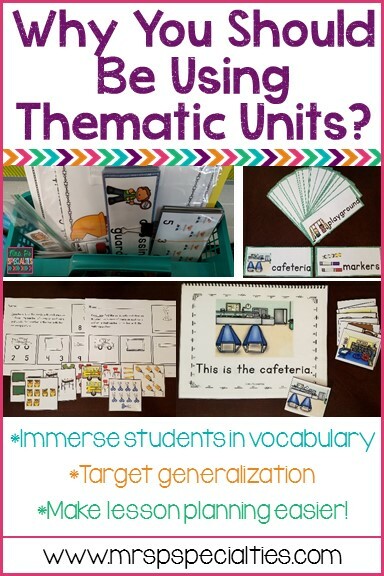 Why You Should Be Using Thematic Units | Mrs. P's Specialties! Do your students need a lot of repetition and practice to master skills? Do you have students who need direct instruction in order to generalize their skills? Want to make lesson planning easier? If you answered yes, then thematic units are for you!! My job got so much easier when I began using thematic units to teach. Theme units immerses my students in the associated vocabulary and concepts which they need in order to truly master the skills. Every student achieves a higher rate of mastery with the theme units versus when we don't use this approach. Wondering what I mean when I say we immerse the students in the vocabulary and concepts? Pretty much everything we do is associated with the theme so the students are seeing and using the vocabulary and pictures over and over and over. For example, the picture below is some of the materials we use for the school unit. You can see that the students are seeing the pictures and hearing the vocabulary over and over and over. Just what my students need! Thematic units give us the time we need in the schedule to teach students multiple examples of the vocabulary. In the picture below, I hid multiple images (photos and clip art) of the apples & pumpkin theme unit vocabulary around the room. After students found them, we sorted them to highlight that even though the picture isn't the same, the label was. This is crucial for my students with autism. Otherwise, they can become rigid and don't understand that items can come in different colors, shapes, etc. A perfect example is a pen. I have about 6 different types and colors of pens in my desk. Students need to understand that they are still all pens. Thematic units also help keep my students interested in the learning task even when they are targeting the same skills over and over. We change everything to reflect the current theme. Below, you can see some of the work tasks we use in the transportation theme unit. Changing the work tasks to go along with our theme also gives us another opportunity to practice vocabulary. For example, in the clip card picture above you can ask students which vehicle they counted or where the vehicle goes. With the tens frames, ask students which community helper is next to the number, have students tell you what the mechanic does, how does he help the community, etc. Thematic units also make lesson planning SOOOO much easier!! Um, yes please!!! Once I have prepped the theme materials, I store them in a basket so I can pull them when I write lesson plans. This post about my lesson planning system gives you more details. 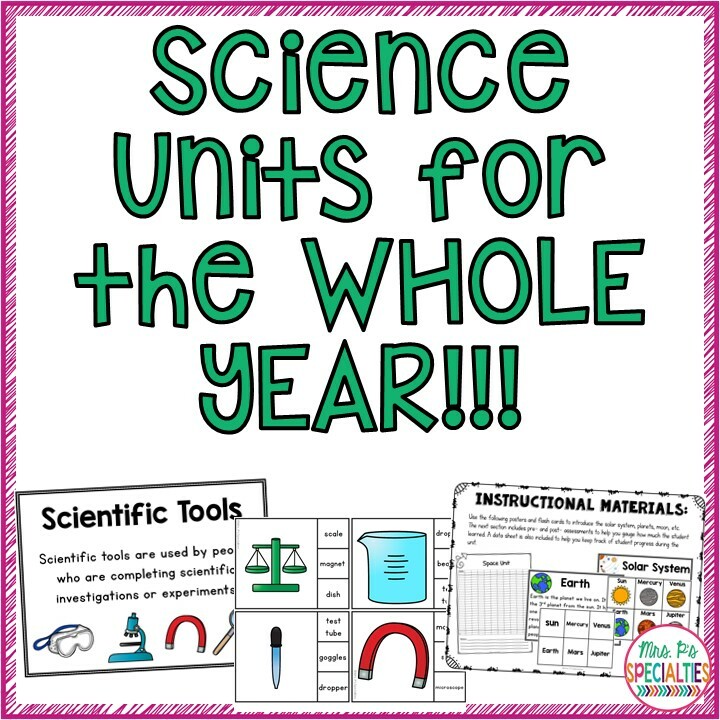 Theme units aren't just for ELA and math! 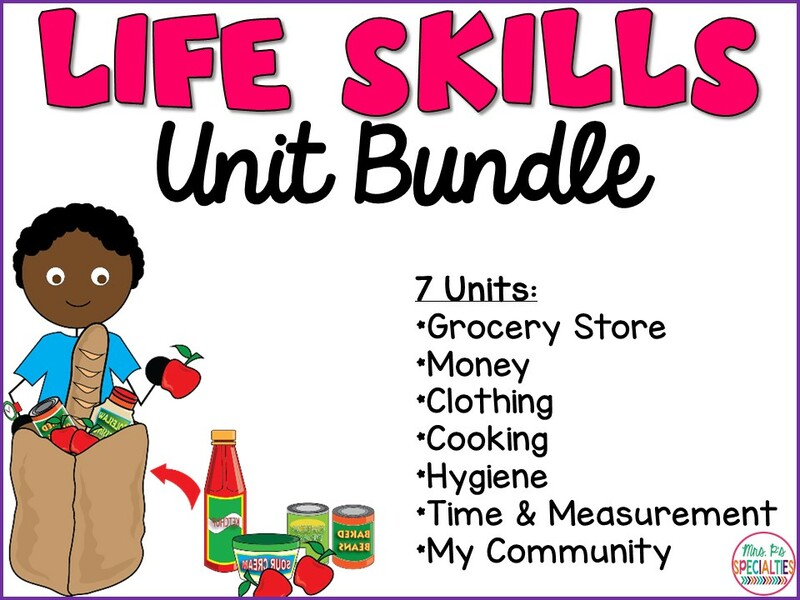 You can also use theme units to teach science and life skills in your classroom!! I love thematic units! I have no idea what my first thematic unit of this school year is going to be though... I'm brand new and haven't even seen their IEPs yet so I haven't been able to do much planning! The first unit we start with is school. That way we can focus on rules and routines, labeling school items, learning their functions, etc. Hope your first year goes well!!! Do you also use specific reading curriculums(ie. Edmark)or do you only use your thematic units for all of your different work areas? I am struggling with this, because I don't want to bombard the students with TOO MUCH vocabulary throughout the day. Thanks for your email about this. Feel free to email with any other questions.